The last dessert I chose for my Tower of Treats were truffles. 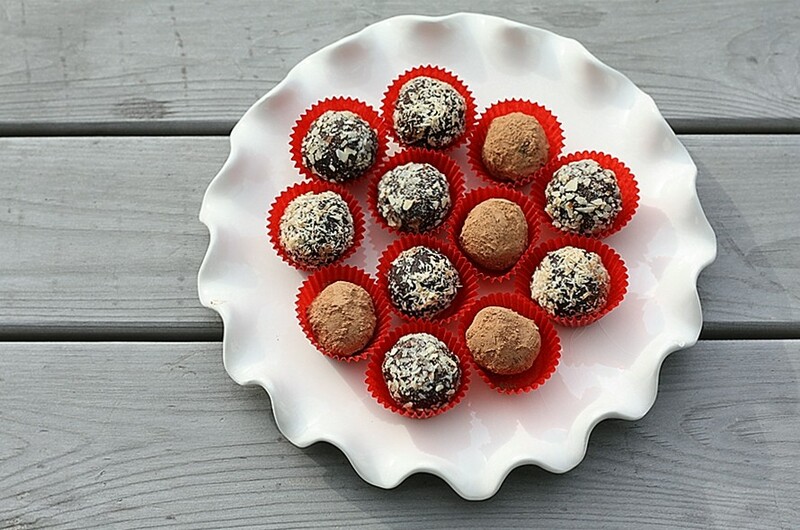 Who doesn’t like truffles? The day before the auction I made the truffles and the caramels. I figured that trying to make everything in one day would be a little crazy. So the night that I made the truffles and caramels, I was exhausted…if that was all I had to do during that day, it would have been easy – but with two kids, it is never like that. Nevertheless, I had to rally, we had a pre-adoption party to go to. chocolate really lumpy, and he felt like he wasted hundreds of dollars’ worth of good chocolate. Egg whites? Those were nowhere near my truffles – and I laughed at him, and told him that truffles don’t have egg whites – just cream and chocolate. He looked me straight in the eye and said, “You obviously have no idea what you are talking about.” Wow. Ok – I didn’t go to culinary school, and definitely have a lot to learn when it comes to cooking and baking – but come on. That was quite a statement. It was a good thing I was so tired – otherwise I would have ripped this guy a new one. But, I just turned around a got a drink – and relished in the fact that I had made some damn good truffles that day – and his were a bomb. These truffles were like the ones I spend tons of money on at Fran’s Chocolates – I swear. Ok, maybe I am going a little overboard, but these were a chocolate lover’s dream. So rich, creamy and decadent – and yes, I’m sure it has a lot to do with the fact that I used high quality chocolate. They were also particularly easy as far as truffles go – my daughter helped me roll them. Most people liked the ones rolled in cocoa the most – because of the texture – but I preferred the coconut – I just love that coconut flavor. Go ahead – try them out – but leave out the egg whites – they ruin the consistency, I am pretty sure of that. Line baking sheet with waxed paper. Drop mixture by rounded teaspoonfuls onto prepared baking sheet. Freeze until firm, about 45 minutes. What a weirdo. I’ve never made truffles and am not the best cook in the world, but even I know there are no egg whites in truffles. Good job at keeping your composure. I don’t know that I would have been able to keep my temper in check if someone talked to me like that! I make truffles during the holidays and this year, forgot to do it. Yours look gorgeous and I love the red!! Egg whites, c’mon? Who does that? Apparently a novice truffle maker. HA! !